1) The time the High Priestess of Gool-Udana called forth a dragon to repel this demonic invasion we were doing, but she forgot to do the binding spell so all she had was a pissed off dragon. It ate her on the spot, and we had to call off the invasion for a couple of centuries until the thing calmed down. The place was ruined anyway by the time we got back, but the burp that guy gave after he ate her was pure comedy gold. 2) The time we swiped the clothing from the Paladins of some world. I forget the name. Anyway, these guys had to come out and fight us naked. All they had were shields and weapons. Their faces were all red and the whole time they kept trying not to look at each other. And they kept apologizing to each other if they bumped. They still kicked our asses, but it was worth it for that battle alone. I hate paladins. 3) Right now, when this guard looked Norman right in the eye and told him to go out to the nearby vineyard and kill eight bandits. "Well met!" the guard says in his helmet-muffled voice. 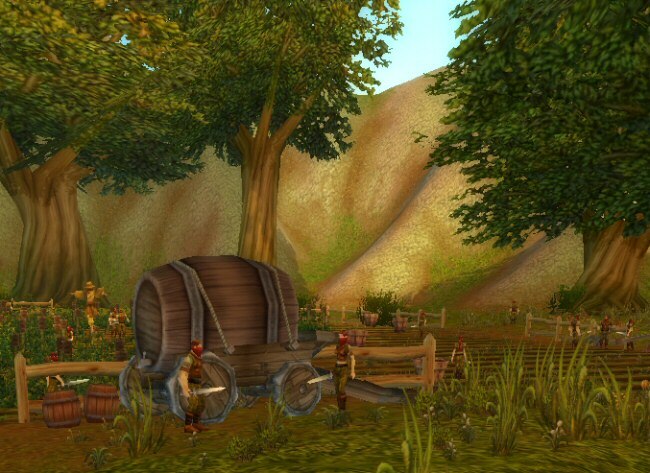 "Recently, a new group of thieves has been hanging around Northshire. 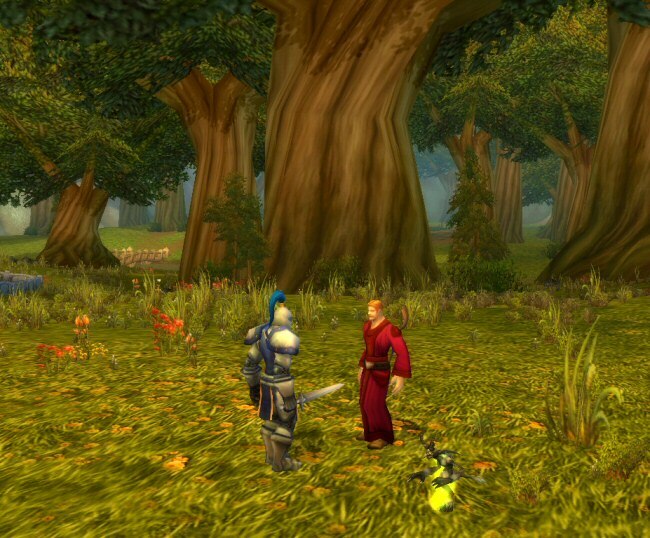 They call themselves the Defias Brotherhood." "Oh," is all Norman can say. He looks down at me in horror. I'm trying to stifle my laughter, but it just makes flame come out my nose. "I don't know what they're up to," the guard continues. "Well ... you said yourself that they're thieves. So I would guess they're up to some sort of thievery." "Well whatever it is, I'm sure it's no good!" The guard seems to be nodding his head but the helmet doesn't move much. It's too big for him. "Yes. Thievery. I'm sure that's just the sort of thing that you could arrest them for." "Bring me eight of the bandanas they wear." Norman shuffles away, crushed. He leads us over to the vineyard where the bandits are milling around. I laugh the whole way there. "You ... you knew!" he says accusingly. "Of course I knew!" I say when I've caught my breath. "I saw these idiots when we were at the graveyard." "The best part? You knew it was stupid to bet me, and you did it anyway. Now pay up." Norman takes a deep breath, "Okay, in order to get into the warlock union you have to ... sacrifice a virgin. And then drink her blood. That last step is semi-optional, though." "You can do better than that. Come on. Who'd you kill?" "That's all I'm saying for now." "Pardon me, madam", Norman says clearing his throat, "But could I get that red bandana from you?"